As electronic musicians, bass players and guitar players alike, we’ve all been drawn to the “next coolest thing” or heard of “this one dude making insane ___________ boxes!” That dude, of course, is the modern boutique pedal builder, who is passionate about giving us a fresh perspective about what’s possible for our tone. It’s what we gravitate toward, that gourmet sonic ingredient. That, which will create thee sound. For most of us, including me, there is the romantic notion of a hand-crafted analog pedal, painstakingly soldered, numbered by hand, individually painted, blessed by Tibetan monks. (Maybe not that last part, but you get the idea.) For this, all boutique pedal builders are to be commended for pushing the sound and design envelope which has stoked the creative fires in a huge number of bass players, including me. Thank you! But, there is a passion for tone pushing the sound and design envelope from another direction; using the science of sound and cutting edge digital technology to get to the end result. That’s the mission of digital pedal builders Source Audio. Chief Scientist, Bob Chidlaw, brings a vast musical knowledge to Source Audio with over 40 years of effects and amp building and 20 years as Chief Scientist at Kurzweil. And colleague and engineer, Jesse Remignanti, brings cutting edge digital signal processing innovation to the design and execution of the Source Audio lineup. It’s their combined passion for musical science and technology that has pushed pedals like the Pro Classic Distortion, Bass Envelope Filter Pro, and the other worldly Hot Hand products to the front of modern guitar and bass pedal design. 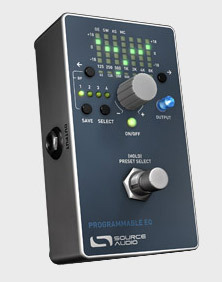 One of their latest offerings is the Source Audio Programmable EQ, and it too is digital. You may be an analog guy or not. Regardless, the Programmable EQ is simply a great tool to have in your arsenal. It’s rugged, silent, intuitive, flexible, MIDI capable, and it also has an interesting “X Factor” as well, more on that later. The Programmable EQ has 7 band range with +/- 18dB capability. You also get an additional 8th band at 62 Hz, which can be programmed with the Octave Extend Backpage function. This gives bass players additional flexibility, especially for creating a scoopy slap sound, fat and dubby reggae tone, etc… The “Band Select Buttons” are clearly marked with left and right arrows. Once a frequency is selected, you use the grey encoder knob in the middle of the pedal to boost or cut dBs. The Programmable EQ lets you save up to four presets. Simply push the “Select” button to scroll through the presets. Each preset has an LED indicator and the saved EQ curve is visible above as you scroll through your presets. When you have a curve you like, just press and hold the “Save” button for two seconds and you’re done. The overall output for each preset is controlled by a brightly lit blue knob, which actually glows brighter the higher the output is set. That way you have some idea of the output of each preset as you scroll through. Smart. The output is automatically saved along with the chosen preset. The footswitch is true bypass and also functions as a preset selector. Once you engage the footswitch you can press and hold it to scroll through your presets, just release the pedal when you’ve found the preset you want and you’re ready. Though not technically an effect, an EQ pedal does make valuable contributions to creating tone and there are many EQ pedals available. Whether you like the idea of using an EQ with state of the art DSP, 56-bit processing , and 24 bit converters or not, you gotta like the extra thinking behind it. Digital or not, a tool like the Source Audio Programmable EQ this is certainly worth consideration. And you don’t have to boot any of your state of the art, hand-crafted, boutique beauties to use it.